On May 11, 2010 Monica Bonvicini’s sculpture She Lies will be inaugurated in Oslo’s inner harbor in front of the Den Norske Opera & Ballett (The Norwegian Opera & Ballet) in the presence of Her Majesty Queen Sonja of Norway. 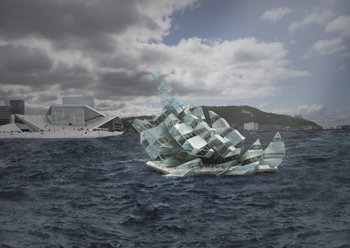 She Lies is a monumental sculpture built out of stainless steel and glass panels that measure approximately 12 x 17 x 16 m. The piece is permanently installed and floats amidst the fjord on the water. By turning around its own axis in correspondence to the tides, the sculpture offers changing views through the reflections on the mirrored and semitransparent surfaces. A crucial aspect of this commission is the challenge of the change expected in this location since the completion of the opera house. She Lies is meant to be a monument about change, longing and hope, a memorial for the construction itself. It stands for its implicit visions and the beauty of the un-done as a permanent state of change. Bonvicini’s sculpture is a three dimensional interpretation of Caspar David Friedrich’s painting Das Eismeer, 1823-24. It is particularly referring to the central motive of the work: the massive piles of ice that function as a symbol for power and magnificence of the north. Monica Bonvicini is one of the most influential artists of her generation. Her large scale installations explore specific conventions and investigate the relationship between space, power and gender. One of the most interesting aspects of her work are the expressive formal discussions via site specific sculptures. Through the reflection on gender issues, often reinforced by biting humour, her work addresses the issues of ‘building’ in both architectural and social aspects. Monica Bonvicini, born in 1965 in Venice, lives and works in Berlin. She was the subject of numerous solo and group exhibitions in museums and institutions such as 1. und 3. berlin biennale für zeitgenössische kunst (1998, 2004); La Biennale di Venezia (1999, 2005, 2009); Magasin, Grenoble (2001); Palais de Tokyo, Paris; Shanghai Biennial, Shanghai Art Museum; Kunstmuseum Aarhus (2002, 2009); New Museum, New York ; Museum of Modern Art, Oxford; Secession, Vienna (2003); Migros Museum, Zurich; Sprengel Museum, Hanover (2004), Museum Abteiberg, Mönchengladbach; Hamburger Bahnhof – Museum für Gegenwart, Berlin (2005); Kunstraum, Innsbruck; Museum Ludwig, Köln; Biennale de São Paulo, Brazil (2006); Bonniers Konsthall, Stockholm; Sculpture Center, Long Island City, NY (2007), Prospect.1 Biennial, New Orleans; Pinakothek der Moderne, Munich; MARCO Museum, Vigo (2008); Lenbachhaus, Munich; Museum für Gegenwartskunst, Basel; MUSEION, Bozen, The Art Institute of Chicago, Chicago (2009). Monica Bonvicini is represented by Galerie Max Hetzler, Berlin. She Lies was commissioned by Public Art Norway – KORO and KISTEFOS A.S.
Monica Bonvicini’s solo exhibition Bet Your Sweet Life is on view from April 30th until June 05, 2010 at Galerie Max Hetzler, Oudenarder Str. 16-20, D-13347 Berlin.